New Engineering Namer variant could prove crucial in future guerrilla warfare; capable of constructing bridges over obstacles. With the threat of Hezbollah looming in the north and Gazan terrorists in the south, the IDF continues to upgrade its already formidable armored capabilities adapted to guerrilla warfare. On Thursday, the Defense Ministry announced the first successful combat drill involving a new variant of the Namer (Tiger) Armored Personnel Carrier (APC), which is capable of traversing terrain which other armored vehicles cannot. The exercise took place on Wednesday in the Golan Heights, and involved the advanced "Engineering Namer", which is being incorporated into the IDF's Engineers. During the drill, the APC successfully broke through a number of obstacles and structures, and even crossed a formidable anti-tank ditch twice - once by simply driving straight through it, and a second time by ingeniously constructing a bridge over the ravine. (See video above). Like standard versions of the APC, the Engineering Namer also comes equipped with the Trophy missile-defense system, which protects against shoulder-launched anti-tank rockets of the kind commonly employed by terrorists in Hamas and Hezbollah. 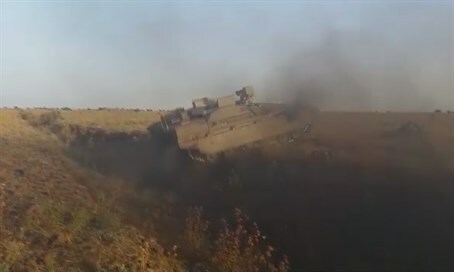 The Namer APC comes in three variants: One version for company commanders, which comes equipped with a tractor blade for digging, another for platoon commanders, which includes a special attachment for breaching solid structures, and a third version for platoon sergeants, which comes with special attachments which enable it to tow other vehicles and construct bridges, as seen in the video above. The Namer, with its revolutionary defense systems, is credited with saving dozens of soldiers' lives during the summer 2014 war in Gaza.